The NBA Closer is written by Matt McHale, who almost feels sorry for the Lakers after last night's debacle. Okay, not really. When he's not dancing his little victory jig, he can be found thanking Sturla for the graphic at Basketbawful. Enjoy! That'll teach me to go to the bathroom. So it's the third quarter, and the Celtics are down by a jillion. Lamar Odom is smiling like a baby with bad gas and Pau Gasol is doing his crazy mountain man thing. I was annoyed. Disgusted even. Shrugging my shoulders, I grabbed a magazine and decided to go free the chocolate hostages. What was the point of watching, right? 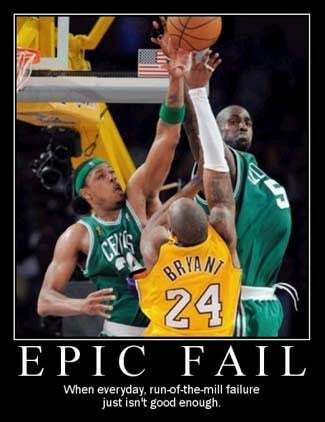 The Lakers were dismantling the Green Machine and Kobe, at the time, had like one field goal. I honest-to-goodness figured it was over. I returned from a thoroughly unsatisfying dump — yeah, I know, probably TMI — to find Boston trailing by only two points. I seriously would not have been any more surprised if Santa Claus and Bigfoot had been in my living room watching the game. L.A. was leading by 24 points in the first quarter, which I believe was the largest first-quarter lead in NBA Finals history. The Lakers were still up by 18 at halftime, thanks to a crazy, running three-pointer by Jordan Farmar that banked in at the buzzer. And Kobe Bryant was a complete non-factor during all of this. I mean, there couldn't have been a bigger sign that the Celtics were toast. Nobody told them that, though. Boston outscored L.A. 31-15 in the third, thanks in part to a 10-1 run to end the quarter. The Celtics then used a 21-3 run in the final five minutes to finish off what may be the greatest Finals comeback ever. How in the world?! How'd Phil Jackson — Mr. Lord of the Rings, Hall of Fame Coach himself — get out-thunk by Doc "Everybody thought I was a retard last year" Rivers? Maybe it was genius, or maybe his hand was forced by injuries (to Rajon Rondo and Kendrick Perkins), but Doc went to a small lineup full of bombers — KG, Paul Pierce, Ray Allen, James Posey and Eddie House — and it worked. Big time. And Jackson had no answer for it. Paul Pierce had 20 points, 7 assists, and did a better-than-you-woulda-believed job of guarding Kobe in the second half. Ray Allen played every single second of the game and finished with 19 points and 9 rebounds, plus he walked calmly around Sasha Vujacic's slap-happy defense and hit a game-clenching reverse layup. Kevin Garnett added 16 and 11, and (as promised) he made a concerted effort to take the ball inside instead of bailing out and shooting jumpers. But damn, the real heroes of the game were James Posey (18 points, 4-for-8 from distance) and Eddie House (11 points, two huge fourth-quarter threes). They brought energy off the bench and the spread the Laker defense so thin that Stephen Hawking could have wheelchaired in for a layup. Assuming he hasn't already transferred his amazing brain into an unstoppable robot body. Kobe Bryant finished with 17 points on 19 shots after not scoring a point in the first half. He is the MVP and — as Mike Breen bleated out about 20 times last night — the best closer in the game. But he couldn't close last night. Said Mamba: "They were determined not to let me beat them tonight. I saw three, four bodies every time I touched the ball." Which is pretty standard defense against a superstar, right? Look as great as Kobe is — and he is great — can we all just go ahead and agree that he's not Michael Jordan? Phil Jackson isn't worried. Or claims not to be. Said the Zen Master: "Some turnaround in that game. The air went out of the building. Well, it's not over. This is not over. The series it not over." If you say so. Game 5 is on Sunday in L.A.